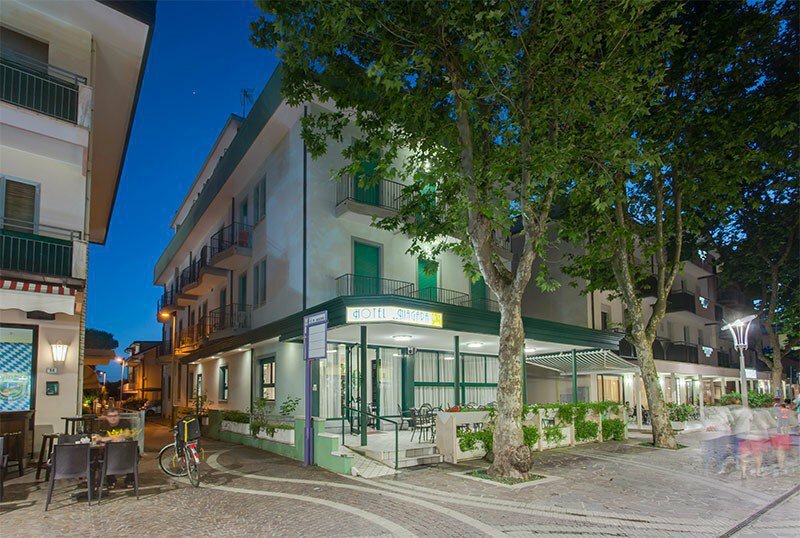 Near the beach of Igea Marina, the Hotel Niagara is a 2-star family run hotel that offers parking, WI-FI connection, agreements with equipped beach and amusement parks. No pets allowed. The property is located a few steps from the sea and a short walk to the center and the pedestrian avenues of Igea Marina. Not far from the structure there is the Polo Est, a recreational area open to the public where free shows and events are organized. The hotel has 30 rooms all with balcony, WI-FI connection, digital terrestrial LCD TV, ceiling fan, safe, private bathroom with shower and complimentary toiletries. Open-air porch, terrace, reading room with satellite TV and newspapers, lift. Theme nights are organized. PARKING: free, covered and uncovered parking spaces until exhaustion. AIR CONDITIONING: in the hall and in the dining room, ceiling fans in the rooms. CONVENTIONS: beach and amusement parks of the Riviera. LUNCH AND DINNER: guests have 3 menus to choose from, based on meat and fish, with traditional local dishes always accompanied by buffet of side dishes and desserts. In hotel: paid pediatric consultation. At meals: baby menu, baby food, high chairs at the table. The hotel has an agreement with the Bagno Marco beach n. 66-67 equipped with beach umbrella and sun beds rental, children's playground area, relaxation area, playgrounds, entertainment for adults and children. Desire for freedom and simplicity! Formula B & B with a rich breakfast starting from € 22.00.